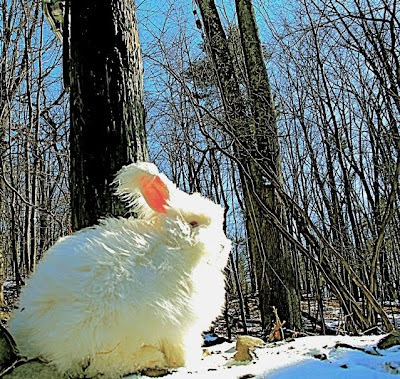 potentially nervous: nuage looking not unlike a 70's postcard expresses his opinion visually "bunny photos do not grow on trees" GRAND UNVEILING OF BUNNY MERCH TOMORROW!!! nuage looking not unlike a 70's postcard expresses his opinion visually "bunny photos do not grow on trees" GRAND UNVEILING OF BUNNY MERCH TOMORROW!!! Nuage looks ready to take on the world! Very exciting news. We're both looking forward to seeing what kind of stuff we can buy! Beautiful photo. Of course it looks sooooo cold. Good thing Nuage has a fabulous winter coat to keep him warm!